A very inexpensive way to decorate a wall is with a pothos plant and push pins. 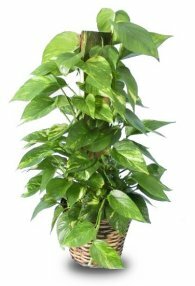 A pothos is a very inexpensive, fast-growing vining plant that can be "trained" up a wall, around a window opening, or even across a ceiling. A pothos can adapt to a wide range of both natural and indoor lighting conditions. This is a gradual and ongoing project, but looks very impressive during any stage. First you must choose the wall that you want to cover. Plant several small pothos plants in a container against the wall. Make sure the plant gets some light, and water regularly. The plant will start to grow in a vine-like fashion, and will begin to trail down the side of the pot. This is when you start to train the pothos up the wall. Using clear push pins, gently pin the vines to the wall. Don't push the pins into the stem; just push the pins beside the stem, preferably into a crook between the stem and a leaf. Also don't push the pins completely into the wall, but instead push the pins far enough to anchor the stem to the wall. As the vines continue to grow, keep using more push pins to anchor the vines to the wall. Very soon you will have a living wall decoration! You can trim the vines when they get to the desired height, or you can continue to pin the vines up to the top of the wall, and even across the ceiling. Any vining plant can be trained up a wall, but a pothos has the best lighting adaptability and grows quickly enough to become a very impressive, inexpensive and unique wall decoration.